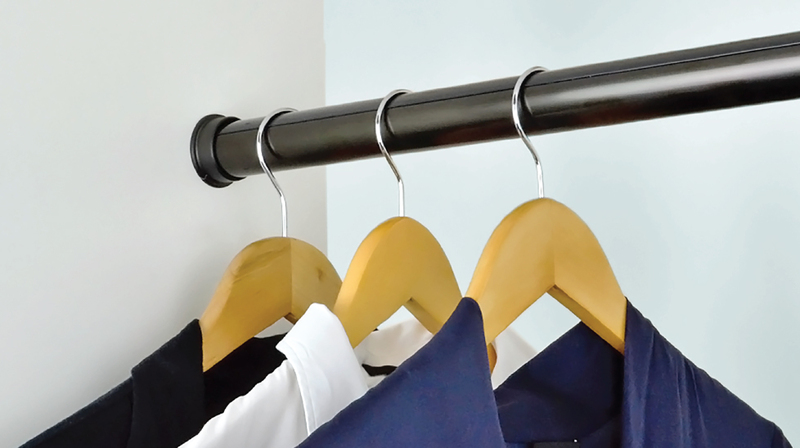 Without taking sides on the closet pole vs closet rods vs wardrobe tube naming debate, TAG Hardware has two capped pole/rod/tube designs that deliver superior design and functionality. To keep things moving along, let’s call them closet poles. 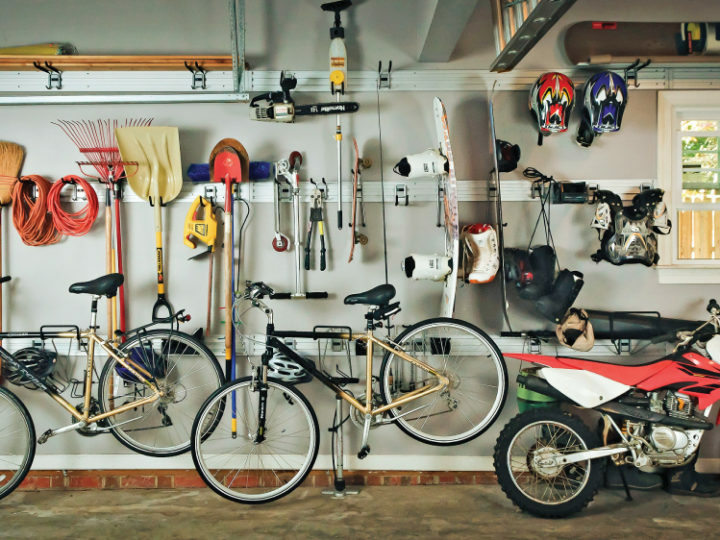 Many of us are old enough to remember wooden dowels, and the not-exactly-major innovation that came shortly after, white painted wooden dowels. The chromed oval steel rods still offered today by many builders were a higher-strength performance upgrade but offered limited improvement on the aesthetic front. Today, TAG Hardware’s capped aluminum poles come in several anodized finishes that match with our lines of accessories as part of our coordinated hardware systems. TAG Hardware has two very different profiles of capped closet poles; both are light and strong, so the choice of profile is one of taste. The ELITE closet pole is a round profile 1 5/16” in diameter, and the Signature closet pole is a slightly tapered hourglass profile with a ribbed detail along the sides. The design language of both poles connects into what you see in other TAG Hardware accessories: the same ribbed detail in the Signature pole is seen on the front of our ELITE shoe fences and subtly on Engage drawers or ELITE pull-out racks, and the smoothly rounded arc of the ELITE pole is seen in a wider radius on a variety of our other accessories. For exposed closets, Suspended Supports for Signature pole are a great option as they do not require side panels for installation. Paired with the Signature Suspended Center Supports, a suspended Signature pole provides a very modern look for contemporary closet designs. 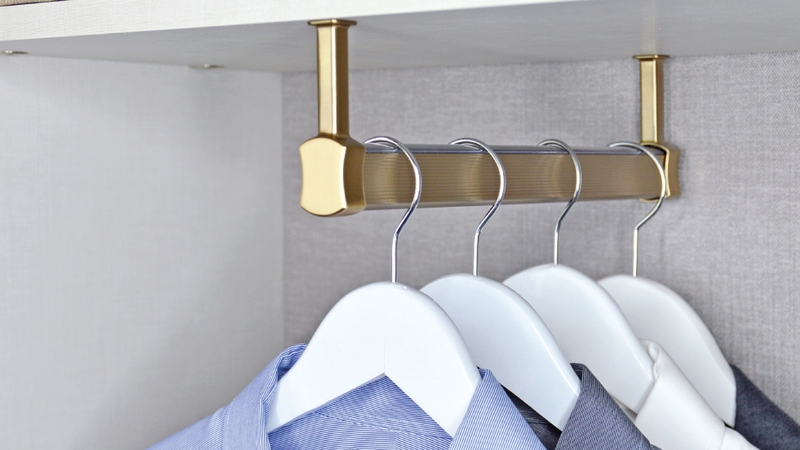 Suspended Signature poles can be mounted facing outward to create a boutique-style rack, or used as an alternative to a valet for planning outfits. Both the ELITE and Signature closet poles feature a hardened plastic wear cap on top. 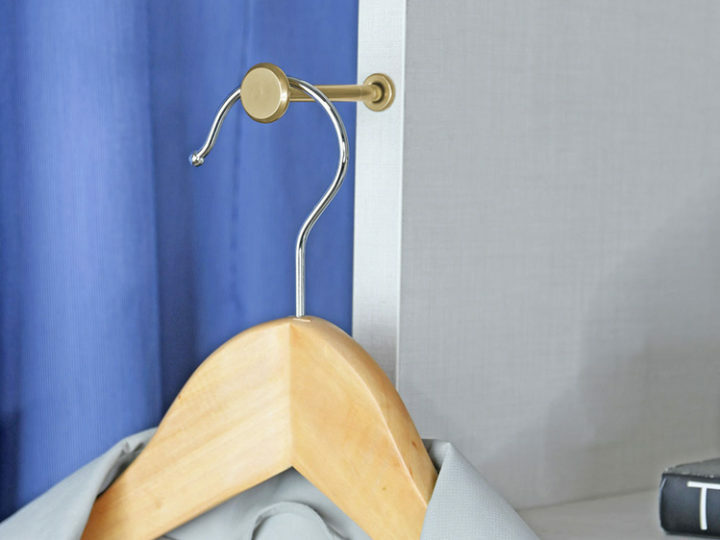 The cap allows even metal hangers to glide smoothly and quietly. The durable anodized aluminum on our accessories isn’t prone to scratching anyway, but the plastic cap means that there’s no metal-on-metal sound on the poles even with wire hangers, a huge plus in the morning. Last but not least, TAG Hardware’s ELITE and Signature poles are available in several coordinated finishes that complement varied wood colours and textures. 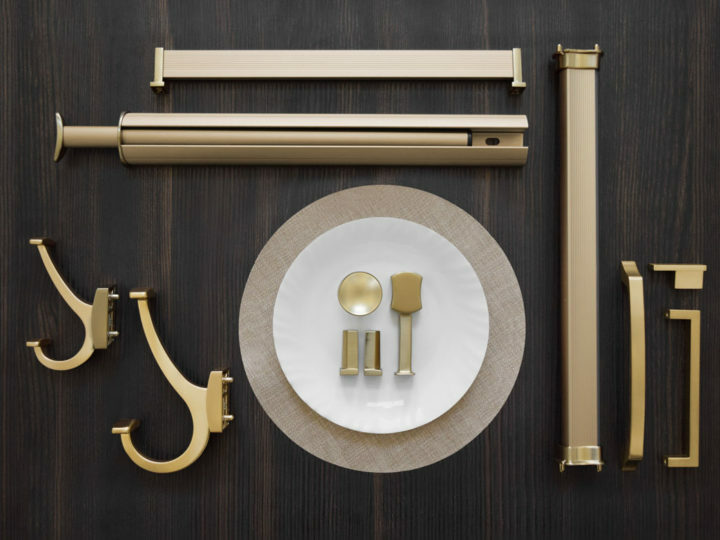 Bright polished chrome, rich matte gold, clean and subtle matte aluminum, warm and understated matte nickel, and deep oil rubbed bronze all blend into or pop against different wood colours and materials. 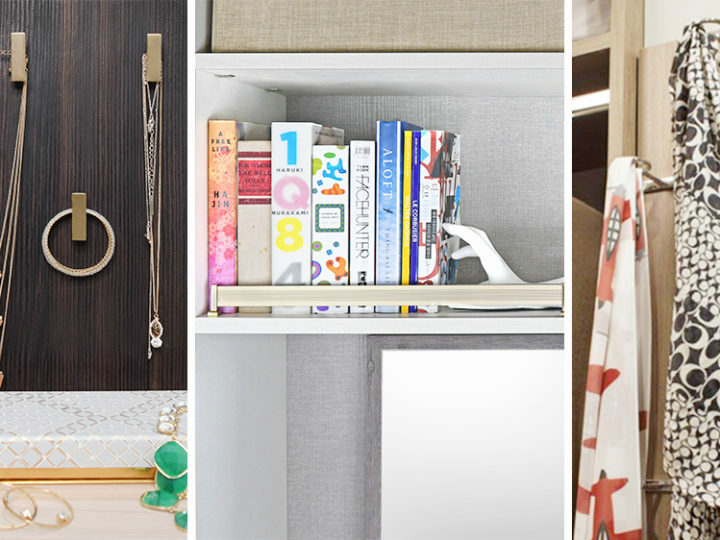 Even simple white melamine looks very fresh with matte gold TAG Hardware ELITE or Signature poles and some organizational accessories to complete the closet! TAG Hardware’s patented pole cups provide a variety of different mounting options that work seamlessly into your creative closet designs, completely covering the ends of cut-to-length ELITE and Signature poles. Standard pole cups for both styles of poles are two-piece designs, with a triangular-shaped piece with 5mm pins set for 32mm system holes, and a round (ELITE) or hourglass (Signature) outside piece that drops into place and holds the end of the pole. With no screws required, the pole can be repositioned higher or lower just by lifting it out and popping the standard pole cups it into new system holes.